Needless to say, this novella is a bit of a doozy. Molly leads a pretty sheltered life, obviously, and while her parents are fairly integral in her younger years, you don’t really get to know a ton about them until the last few pages (which give you the OOOOOOOOOH moment of the story). 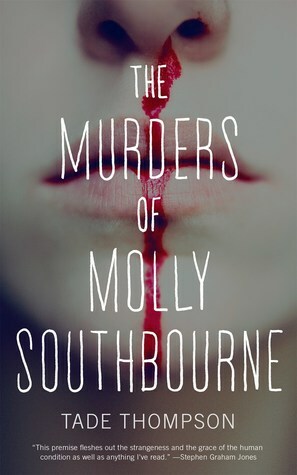 Up until then, it is life filled with the need to survive, along with a murderfest of duplicates that only intensifies when Molly reaches her teens. I knew from reading Thompson’s ‘Rosewater’ that I was in for some superb writing and an original story. What I didn’t expect was to constantly keep coming back to this novella for more. It had some sort of hold on me and I couldn’t get it out of my mind. If you are looking for a creepy, downright horrific novella to set your nerves on edge, check it out. I mean, come on… Could you imagine seeing another You come out of a hole in the ground and straight up want to murder you? Not to mention when there are multiple… GTFO. Yep, this was a strange one, but I loved it! I’m looking forward to the next in the series.